Be the first to share your favorite memory, photo or story of Chandler . This memorial page is dedicated for family, friends and future generations to celebrate the life of their loved one. JOHNSON – Of Billerica, Feb. 6, Chandler T. Johnson beloved husband of Catherine A. (Petchell) Johnson. Loving father to Stephanie Walker of Malden, Stacey Murray of Peabody, Tamara Ducasse of Medford, Carla MacLeod of Londonderry, NH and Jaclyn Stover of Wilmington. Brother of Pearl Morrison of Arlington, Hazel Marbury of Somerville, Dilcy Garro of Medford and the late Harry and Dawson Johnson and Anne Stephenson. He is also survived by ten grandchildren, John, Nikelle, Damon, Shane, Chase, Darius, Damaris, Bria, Braeden, Priya and two great grandchildren. He was the son of the late Harry S. and Annie Johnson. A visitation will be held Saturday at the Sweeney Memorial Funeral Home, 66 Concord Rd., Billerica from 2-5 p.m. Relatives and friends respectfully invited. 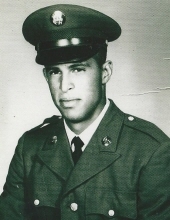 Mr. Johnson proudly served in the U.S. Army during the Vietnam War. Memorial contributions may be made to the Wounded Warrior Project, www.woundedwarriorproject.org. "Email Address" would like to share the life celebration of Chandler T. Johnson. Click on the "link" to go to share a favorite memory or leave a condolence message for the family.